Trexin developed disruptive business and technology strategies that will bring more positive health outcomes for consumers. Development from funding to fully operational, with networks, campaigns, systems, and, support in a six month timeframe. Create a new type of insurance and health care experience for the potential consumer, the member, and the provider. Establish and sustain people, processes, and technology to grow and support the new organization. Navigate and thrive in the new world of the Affordable Care Act and promote simplicity and innovation among consumers, members, and providers. Operate on a lean budget in order to compete with existing and entrenched carriers, while innovating in the marketplace. Hire highly competent, creative, and experienced staff with an understanding and passion for the CO-OP vision and mission. Trexin’s strategy on developing the health insurance client focused on a Business Process Outsourced (BPO) approach to enable health plan creation. In this approach, Trexin helped the client to contract with highly experienced partners to create the needed technology and business processes to successfully enroll and support all corporate and health plan functions. Trexin prioritized business and technology needs and solutions using detailed road-maps. Additionally, Trexin instituted guiding principles for vendor management including: Leveraging best of breed technologies and approaches; Reusing existing capabilities where available; Buy/outsource needed capabilities from proven vendors; If needed capabilities are unavailable, build as last resort. 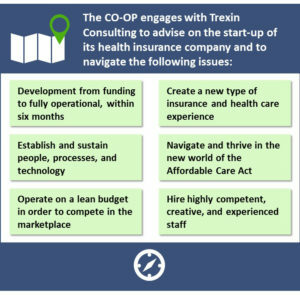 Finally, Trexin assisted the health insurer CO-OP in exercising disciplined project methodology with thorough strategic road-mapping, requirements documentation, solution testing, and agile iterations. Uniquely flexible to respond to CMS requests & Affordable Care Act regulations, market shifts & industry disruption, and the competition’s strategy & tactics. Ability to build tight, innovative, and mutually beneficial relationships with members through simplicity and education and with providers through favorable fee schedules and performance incentives. Greater control over business and technology costs and maintenance though business process outsourcing model, zero legacy systems, and cloud-based/pay-as-you-go technology solutions. Educational and thought-provoking outreach and messaging to communicate that the CO-OP is different from other carriers due to non-profit values, health care literacy efforts, simplicity of doing business, thorough provider networks, and consumer-friendly tools and systems.